"When you arise in the morning think of what a privilege it is to be alive, to think, to enjoy, to love." Rhonda says, "Make today as good as it can be by practicing concentrated gratitude and putting the magic into your morning routine. From the moment you open your eyes until you have put your shoes on or finished getting ready, say the magic words, thank you, in your mind for everything you touch and use. It doesn't matter if you don't shower or get dressed first thing in the morning, you can still use this Magic Morning practice as a guide and apply it to whatever your morning routine is." Page 115, The Magic. Today's assignment is to say the magic words, thank you, as soon as I wake up and from then on I will say thank you for everything I touch and use during my morning routine. I think this is a wonderful assignment. I know I have had days that I woke up thinking negative thoughts. Actually quit a few of them. The most popular one is, "I hate my life." That definitely sets the tone for the day. But if I break that negative record, which I have been working on already because of The Secret, and make a positive one, then my day is off to a great start. I definitely recommend trying this. Just remember, there will be things that pop up during the day that will crush that good feeling and you will have to prop yourself back up with, ". . . but I am grateful for . . ."
Thank you for another day of life because it is a gift. Thank you for a good night's sleep in my cozy bed because it is important for my health. I know there are many people who don't have a comfortable bed and some don't have one at all. Thank you for the toilet because it is hygienic and convenient. There are people who have to use an outhouse or tree. Thank you for the clean water that pours out of the tap because it always me to keep clean and refreshed. I am aware there are people who don't have clean water and some have to travel great distances to get water. Thank you for the soap and towel because it makes life that much more enjoyable. Thank you for my good morning kisses from my two beautiful granddaughters because they are magic. Thank you for the stairs I walk on because it is part of my precious home. Yes, there are homeless people. Thank you for my bowl, spoon, cup, coffee, cereal and milk because my breakfast provides the nourishment and energy at the beginning of my day. There are children in our country who go to school with empty stomachs. Thank you for my closet of clothes because I am fortunate to have them. Thank you to all those people involved in making them transporting them and selling them to me. Thank you for my sandals because I am so very lucky to live in a country where they are easily accessible. I know there are people in the world who do not have shoes let alone as nice as the ones I own. Thank you for the refrigerator. Thank you for the microwave. Thank you for the table and chairs that I eat breakfast at. Thank you for my toothbrush and tooth paste. I am most grateful to Gary for finally taking the money out of the bank and paying the insurance company because it would be terrible to have our policies cancelled for non-payment when we have the money. Thank you, thank you, thank you. The insurance payments have been a huge source of stress and anxiety for me especially over the last year. Gary had virtually no income last year and it has been so hard for me to keep up these payments. Our policies have been cancelled a few times but each time Laurie managed to save our butts. My new "gratitude stone." Thank you, thank you, thank you. For the energy and time to keep my home clean, tidy and organized because it is a wonderful feeling when I glance around the house and see it this way. Thank you, thank you, thank you. For the rain today because it is really helping out our vegetable and flower gardens. Thank you, thank you, thank you. For the first cucumber from our garden because it provided a nutritious delicious snack for Sidney, Faith and I. Thank you, thank you, thank you. For another rainy day because it made it possible for Sidney and Faith to play outside with their rain coats and umbrellas. 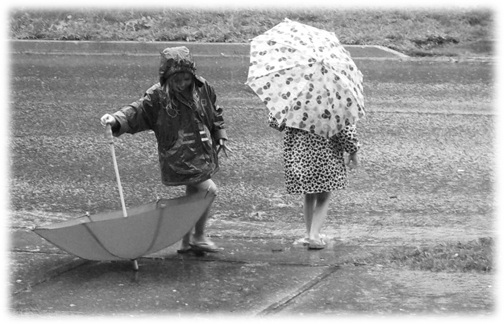 It was so delightful to sit on the front porch, watching my little sweethearts having fun splashing in the puddles. I could hear Faith singing to herself softly as she usually does when she is feeling happy. Thank you, thank you, thank you. To my Mom for stopping by to take Sidney, Faith and I out for supper because I really needed to get out of the house and didn't want to do it without another adult. Thank you, thank you, thank you. For another meal that I did not have to cook or wash dishes because it freed up time for me to spend with my loved ones. Thank you, thank you, thank you. To my Mom for taking us out second hand shopping because I love it when I find great deals. We "shopped 'til we dropped." My Granddaughters think that's funny and it makes them giggle which fills my heart with joy. Thank you, thank you, thank you. To Faith for finding the perfect "gratitude stone" for me because the other one was too big and I didn't get a good vibe from it. Thank you, thank you, thank you. For having money in my pocket because it's comforting knowing it's there just in case. Thank you, thank you, thank you. For the internet because I love relaxing and watching a good movie once my Granddaughters are sound asleep. Thank you, thank you, thank you. This was a simple challenge. I remembered to say thank you for everything I used and touched. Thank you. What were you most grateful for today? I hope you have a magical morning too.